Cellblock Visions is an exhibition of 50 drawings, paintings, and objects made within the last thirty years by men and women inmates of jails and penitentiaries in six states. Included are "mainstream" art forms such as handkerchief art and decorated envelopes. Also featured are prison folk arts such as soap carvings, cigarette wrapper purses, toothpick clocks, and toilet paper sculpture. Paintings and drawings by self-taught artists in the exhibition have been illustrated in a variety of publications and shown in prominent galleries. These artists tell the truth, without self-consciousness, unfettered by concepts and theory. This pure expression of individual personality has produced a wide variety of styles and imagery, and at the same time, the commonalities of their imprisonment color every piece. now I want to show the goodness in me." "The artists of Cellblock Visions are incarcerated so the work has to speak for them. And that it does, with a special urgency. The envelope art is particularly poignant: Envelopes represent communication with the outside, with loved ones. These artists seem separated from the larger world of art, and their work is the stronger and truer for it." 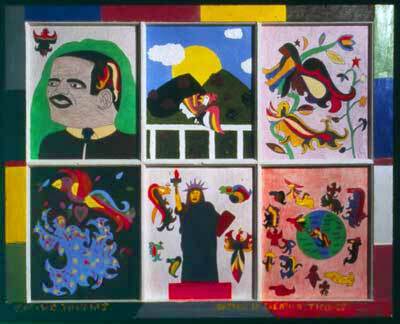 "No one in this field knows the work of prison artists like Phyllis Kornfeld. She has all kinds of experience on the inside and besides, she has a great eye and knows the difference between good art and trite victimhood." "Some of the best prison art I’ve ever seen." "The background information posted next next to Bill Englehart’s art work reveals that 31 of Englehart’s 54 years have been spent behind bars. He writes,‘ I know that mine is a wasted life.’ His work proves that’s not true."